How I feel on Mondays, but also every other day. These t-shirts are screen printed by hand here in the UK onto soft cotton, that’s pretty special guys! These heavy cotton tees are made from 100% snugly soft ring-spun cotton. Please see below for help with sizing. These t-shirts are a unisex fit, please have a look at the chest measurements before ordering. 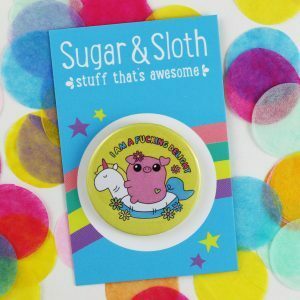 Sugar & Sloth is committed to being an all inclusive brand. If you don’t see a size for you, or your size is sold out please contact us so we can help. Pop them in the washing machine and Iron on reverse. Please avoid ironing the print. White T-shirts are 100% ringspun cotton, Grey is 90% ringspun cotton, 10% Polyester.